As the Western Conference ECHL teams complete their fourth weekend the Missouri Mavericks, with three wins this week, take the overall lead in the ECHL with 17 points (0.773%). Adirondack Thunder of the Eastern Conference follows in 2nd with 16 points (0.889%) and the Florida Everblades in 3rd also with 16 points (0.667). Last weekend Adirondack was the only remaining undefeated team however they lost that streak Friday night (Nov. 6) when they were defeated by the Cincinnati Cyclones 4-2. Missouri, not surprisingly, leads the Western Conference with wins this week with a record of 3-0. Utah played 4 games this week, losing their first to Idaho last Monday however they won all three games in Alaska, with their week’s record at 3-1. Colorado won both of their games this week (2-0), and Allen, Cincinnati, Fort Wayne and Indy ended their week with 2-1 records. At the bottom end Alaska and Wichita lost all three of their games this weekend with a 0-3 weekly record. Rapid City and Tulsa lost both of their games this week (0-2). Rapid City faced Allen in South Dakota on home ice and lost their first game 4-1 and the second was a disastrous 7-2 defeat. Rapid City’s goal differential is the worst in the Western Conference right now at 21 Goals For and 33 Goals Against, with a Goal Differential of -12. Greenville is the only team with a worse record at 21 GF and 40 GA, at -19. Rapid City also ranks near the bottom with team plus/minus at -55. As a comparison the Missouri Mavericks have a +11 Goal Differential (28 GF and 17 GA) and a +47 for the team. By the end of this week on November 15th ECHL teams will cut their Active rosters from 21 to 20 players (by 3 p.m. ET). Some waivers have already been appearing on the ECHL transactions, however expect more this week as teams move some players around. POWERPLAY: The Fort Wayne Komets lead the ECHL in the Powerplay, with 9 games played they have been on the advantage 34 times and scored 9 goals – 26.5%. Colorado Eagles rank 2nd with 10 games played, 34 times on the advantage with 9 goals, at 26.5%. On the bottom ranked 28th is the Wichita Thunder with 10 games played, 39 times on the advantage and the team has only scored 2 goals, 5.1%. PENALTY KILL: The Allen Americans rank at the top of the ECHL Penalty Kill – with 10 games played they have been short-handed 36 times and allowed only 2 Powerplay goals against for 94.4%. Allen has also had 2 Short-handed goals for. Rapid City Rush ranks near the bottom at 24th, with 9 games played, they have been short-handed 21 times and have allowed 5 Powerplay goals against (76.2%) with one Short-handed goal for. *Arrows indicate the weekly trend. 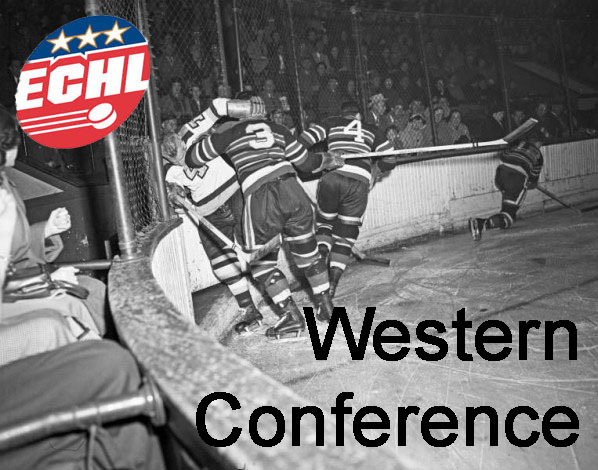 To give you a better understanding of how the Western Conference matches up to the Eastern Conference, here are the Western Conference team rankings as a whole, and below are the Western Conference teams in their overall ECHL league rankings. Later this week we will be looking at some Estimated Time-On-Ice figures for a group of teams in the Western Conference thanks to Eric Rodgers. Eric recently posted his Estimated TOI (eTOI) figures for the Tulsa Oilers and you can follow Eric at @ericrsports or for Tulsa Oilers news only at @SinBinOilers.